We propose a southbound plugin that can control the off-the-shelf commodity Ethernet switches for the purpose of building SDN using Ethernet switches. For Ethernet switches, forwarding table, VLAN table, and ACL are where one can install flow configuration on, and this is done via SNMP and CLI in the proposed plugin. In addition, some settings required for Ethernet switches in SDN, e.g., disabling STP and flooding, are proposed. The modules in the plugin are depicted as the following figure. AclService: add/remove ACL profile and rule on the switches. FdbService: add/modify/remove FDB table entry on the switches. VlanService: add/modify/remove VLAN table entry on the switches. TopologyService: query and acquire the subnet topology. InventoryService: acquire the switches and their ports. DiscoveryService: probe and resolve the underlying switches as well as the port pairs connecting the switches. The probing is realized by SNMP queries. The updates from discovery will also be reflected to the TopologyService. VendorSpecificHandler: to assist the flow configuration services to call the switch-talking modules with correct parameters value and order. For the services above, when they need to read or configure the underlying switches via SNMP or CLI, these queries are dealt with the modules SNMPHandler and CLIHandler which directly talk with the switches. The SNMPListener is to listen to snmp trap such as link up/down event or switch on/off event. 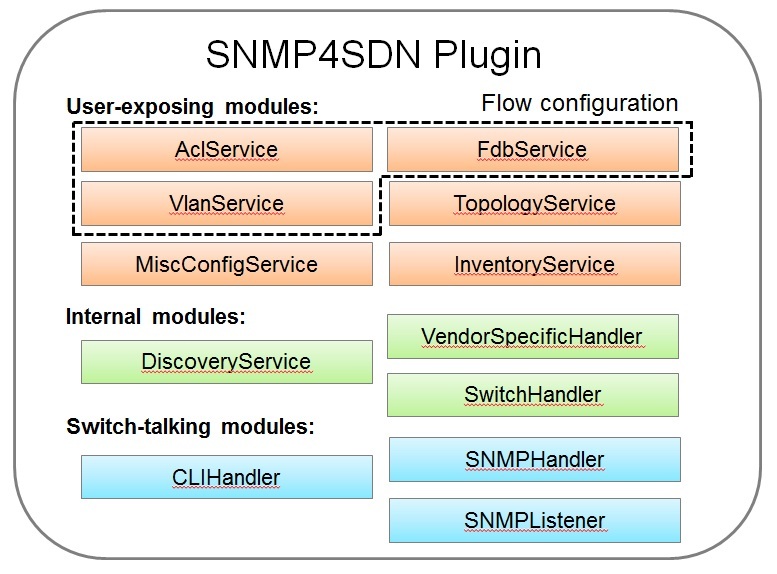 In terms of the architecture of the SNMP4SDN Plugin’s features, the features include flow configuration, topology discovery, and multi-vendor support. Their architectures please refer to Wiki (Developer Guide - Design). Please refer to the Getting Started Guide in https://www.opendaylight.org/downloads, find the SNMP4SDN section. For the latest full guide, please refer to Wiki (Installation Guide, User Guide - Configuration). For the latest full guide, please refer to Wiki (User Guide - Tutorial). SNMP4SDN Plugin exposes APIs via MD-SAL with YANG model. The methods (RPC call) and data structures for them are listed below.